Flu season is underway. Misconceptions about the flu prevent people from taking the proper precautions. For example, being out the in cold does not cause the flu. Here are a few more flu myths I hear and facts to help you stay healthy this winter. MYTH: If you think you have the flu, go to the doctor to get antibiotics. Influenza is a virus and antibiotics, designed to kill bacteria, are not effective to treat flu. Some antiviral medicines, such as Tamiflu, can help and you should ask your doctor if it is right for you. The earlier the flu is detected, the more effective antiviral medicines can treat flu symptoms. MYTH: Mercury in the influenza vaccine will make me sick or give my child autism. Thimerosal is a mercury-based preservative used to prevent contamination of influenza vaccine vials. Extensive research shows an extremely low dose of thimerosal in vaccines and has been found to be safe. If you are still concerned, thimerosal-free vaccines may be available. The nasal vaccine does not have thimerosal. The flu vaccine is made from non-infectious, inactivated virus and cannot transmit the flu. Many mistake the vaccine’s side effects, which can sometimes give mild flu-like symptoms, with the flu. MYTH: Protection from the flu happens immediately after you get the vaccine. It takes up to two weeks to get the vaccine’s immunity. If you are exposed before or during this wait period, you can still get sick. Doctors are keeping a watchful eye on this year’s common flu strain, H3N2. The Centers for Disease Control recommends if you have asthma, lung or heart problems, or diabetes to see your doctor or go to Urgent Care at the first sign of the flu, as these conditions may worsen symptoms. Most flu cases won’t need medical treatment, but in severe cases with the following symptoms, an Emergency Department visit is recommended. Any child or adult who is short of breath, has return of fever and bad cough after starting to get well, has confusion or trouble waking up, or has the inability to take and keep down fluids should be seen by a physician. Children with flu symptoms and a fever with rash, bluish or grayish lips or skin, or extreme irritability should visit the Emergency Department. Babies who can’t eat or drink, have no tears when they cry or have a decrease in the number of wet diapers are showing signs of significant dehydration require medical attention. Ask your primary care physician for a flu shot. If you don’t feel well and need to see a doctor, protect others and wear a flu mask, available at the Emergency Department or at a mask station located throughout the hospital. The flu vaccine, accompanied with frequent and thorough hand washing, are your best protections against the flu. 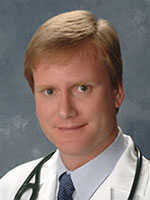 Dr. Lance Orr is the Director of Staff Operations for the Barton Memorial Hospital Emergency Department. He has worked in Barton’s Emergency Department since 2006.